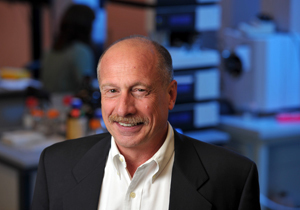 The Royal Society of Chemistry has announced that Norman Dovichi, the Grace-Rupley Professor of Chemistry at the University of Notre Dame, will be awarded the 2012 Robert Boyle Prize for Analytical Science. The biennial prize is given to the candidate whose work is of the broadest relevance to the chemical science community as a whole and whose career is defined by exceptional work, excellence and dedication. It includes a £5,000 cash award, a medal and a lecture tour of the U.K. The prize will be formally presented Nov. 9 in Birmingham, England. Dovichi joined Notre Dame in 2010. His research group was partially responsible for the primary analytical instrument—capillary array electrophoresis with laser-induced fluorescence detection in a sheath flow cuvette—used by the Human Genome Project in its successful effort to determine the primary structure of the human genome. Now that the genome is sequenced, interest is focused on the study of the proteome, which is the protein content of an organism, tissue or cell. The Dovichi group is developing tools to study the proteome with two-dimensional capillary electrophoresis, coupled to either laser-induced fluorescence or mass spectrometry for detection. The group’s long-term goal is to study protein expression in single cells and to determine how protein expression changes across a cellular population during cancer progression and during the development of an embryo. In the shorter term, it is developing tools to characterize post-translational modifications of proteins and to speed digestion and analysis of proteins. Originally published by Rachel Fellman and Marissa Gebhard at newsinfo.nd.edu on June 06, 2012.